I’m somewhat depleted of the energies that would normally go toward brightening your day with daily blog topics, so you’ll have to accept little piddlysquats I can offer in lieu of something more substantial. Things like this: the Wikipedia page on Taft, a California town in Kern County. According to a display at the West Kern Oil Museum, local residents asked the Southern Pacific Railroad if the station could be named Moro when the rails arrived about 1900. A railroad official, the story says, declined because the name would be too easily confused with the coastal town of Morro Bay. Instead, the railroad directed the station be called Moron. Pictures of local businesses, including the Moron Pharmacy, hang in the museum. 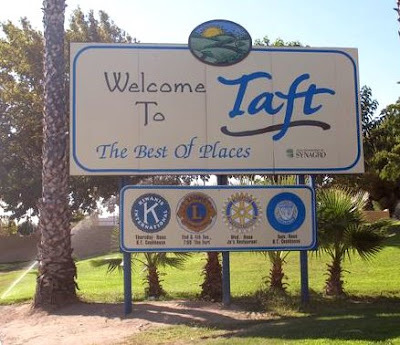 After a fire burned much of the town during the 1920s, it was renamed Taft, in honor of the U.S. President of the same name. According to local folklore the town was actually named after a picture of President Taft. During a meeting at the Post Office to come up with a new name someone suggested Taft based on the picture currently on the calendar on display in the Post Office. It says so on a sign, so it must be true.